skills and how to interact with humans. have had him come into my life. Trooper has adapted again & done amazingly well. To me he'll always be my very handsome special angel. hand or helped to pee doesn't make their life any less valuable. you Lisa and thank you doing everything you do. Read below for Lisa's words on trooper. contacted Patti at GAPR, who called to see if I could go down to check it out since I lived not too far from there. only in this condition but also has no social skills, seemed like he had very minimal human contact previously. 7 years that I would always love & take good care of him. there was so much life in his eyes. 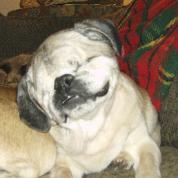 Although he was a blind pug, he had the most soulful eyes I had ever seen. all to me, I just wanted to hold onto him forever. He adapted unbelieveably quickly of course. but locally, people used to fuss over him quite a bit. he went to sleep & simply never woke up. He left this world on his terms, when the time was right for him. place in heaven for these little ones. 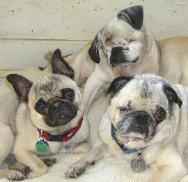 special needs pugs which led to the idea for our new rescue so we can help more of these special little ones. heart, afterall he was my very special little boy.